Forgive me while I gush, but I have exciting news to share! 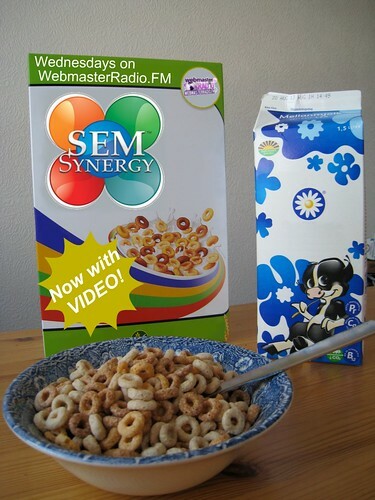 Starting today SEM Synergy takes over more than just the airwaves! Now SEM Synergy comes with video interviews! My interview with Andy Liu aired today on our weekly radio show and podcast on WebmasterRadio.FM. I spoke with Andy at the BlueGlass LA conference last month and he graciously agreed to be my first video interview test subject. In our interview you’ll hear how Andy’s experiences as an entrepreneur (he’s the co-founder of the social entertainment site BuddyTV) and investor (he’s one of the angel investors who helped bring I Can Has Cheezburger to the masses), brought him to recognize the traits of a winning startup. It’s fitting that Andy and his vision of passion, determination and innovation launch our video endeavors for the program. It certainly took a bit of the above to get this ball rolling. Although now that it is, the momentum is building and a process is being formulated. I think I’m getting the hang of things and learning how I can improve. I’ve never worked in the video format before, so I know there’s a long way to go from here. But on the flip side, I’m excited to be looking at an area of growth and opportunity. No one questions the importance of video for user engagement, blended search rankings, brand credibility and link building. Video viewing online is at astronomical levels, and yet businesses hesitate to adopt the format because of resources and technical requirements. I can attest to the fact that it takes time to film video content, learn to use a video editing program, and market them online. But I’m sure investment is worth it. With that, I was wondering if you might be able to help me improve the videos to come. I’d love your feedback as I continue to hone my video production skills. Do you have any questions after watching the video? Did you feel the video was too long, too short or fine as is? Would you change anything about the video? Did I leave out any information you’d like to read in the opening or closing screens? Did you come across any technical issues while watching the video? :D I’m so happy to be exercising my journalist muscle. The video screams pulitzer prize. Great work Virginia!